At Boston University I worked with Professor Selim Ünlü to start one of the first ever interdisciplinary senior design teams, composed of two electrical engineers and two biomedical engineers. The goal of this year long project was to create a proof-of-concept diagnostic device that allows for both enhanced fluorescent imaging and label-free imaging of a DNA microarray. Our team received the 2011 Electrical Engineering Design Excellence Award. For my contribution, I was also awarded the 2011 Michael F. Ruane Award for Excellence in Senior Capstone Design. 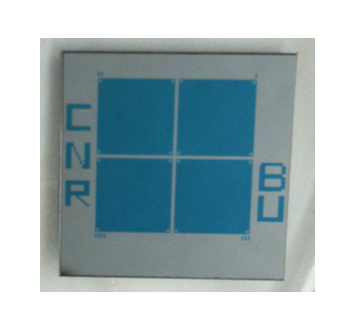 DNA microarrays conventionally use fluorescent tags to determine sequence specificity. Unfortunately, fluorescent scans are notoriously poor at providing quantitative data. To overcome this, Professor Ünlü developed a quantitative, label-free instrument called the Interferometric Reflectance Imaging Sensor, or IRIS. Using microarrays deposited on Si-SiO2 substrates, IRIS images the surface with a spectrally tunable light source, recording the interference pattern due to the Si-SiO2 interface as a function of wavelength. When material, such as DNA or protein, is bound to the SiO2 surface, the change in height due to this additional material shifts the typical interference pattern. This shift directly correlates to the amount of material deposited on the surface, thus providing a quantitative measure for the amount of material bound to the microarray without any labeling. For our project, we re-engineered the IRIS substrate. A simple modification of the oxide thickness allows the IRIS substrate to provide enhanced fluorescent images over standard microarrays fabricated on glass slides. 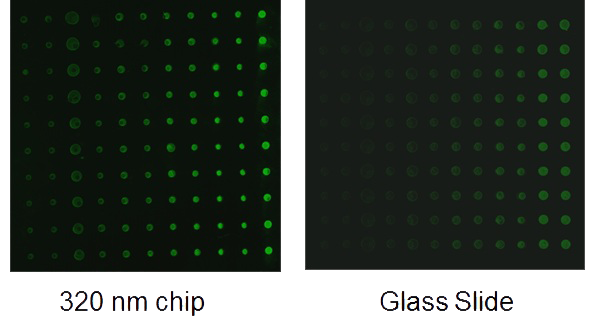 Generally, when a standard microarray is fluorescently imaged, a large fraction of the fluorescence goes uncollected by the sensor since any light emitted in a direction away from the sensor escapes through the translucent substrate. With IRIS substrates however, the silicon layer can act as a mirror, bouncing this fluorescence back towards the sensor. In addition to this enhancement, if the oxide thickness is correctly designed with respect to the wavelength being collected, reflected light will constructively interfere with the light directly emitted towards the sensor. Using Cy3 and Cy5 as our target fluorescent tags, we simulated the interference pattern from these two fluorophores as a function of oxide thickness. We then fabricated the Si-SiO2 chips (right) in the clean room. Finally, we spotted custom DNA microarrays on the oxide surface and used our biomedical teammates’ Influenza A derived DNA samples, extracted from lysed canine cells, to prove that our substrate could diagnose Influenza A with both enhanced fluorescent and label-free imaging. Not only were we successful in doing so, but our substrate provided over 9x fluorescent enhancement over typical glass slides (shown below). Monroe, M. R., Reddington, A. P., Collins, A. D., LaBoda, C., Cretich, M., Chiari, M., Little, F. F., Ünlü, M. S. (2011). Multiplexed, Rapid, Point of Care Device to Quantify Allergen-Specific IgE. Proceedings of the 2011 International Conference on Optical MEMS and Nanophotonics. 231-232.